This over the counter pole tent is perfect for casual backyard gatherings and other outdoor parties. 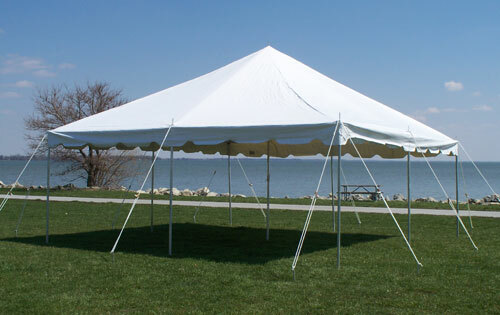 It is sturdy enough for the rental industry use and has a flame resistant 14 ounce vinyl top. The poles are made from durable 1.75 inch galvanized steel with secure push button connections. All pole locations are reinforced to help prevent tearing. This tent comes with all the hardware required and a convenient carry bag to help make set up quick and simple.